Spas operate like a mini ecosystem, with their own interdependent systems that form their environment. Small changes can have a big impact on this delicately balanced system. Each area has its own impact on your bottom line. Operations or management weaknesses have far-reaching effects that may not be seen immediately, but will definitely show over time. Client Satisfaction – Greatly impacts your business, unhappy clients = no business. How do you identify your clients’ needs and meet those needs? Read this blog post we wrote on the subject. Staffing/Compensation – Staffing levels need to be strategic and compensation has to work with the business budget. Management – Needs to be strong. Staff want a leader(s) who can promote the business while keeping a stable and positive work environment. Managers need to execute and implement marketing programs, hire right and be the cheerleader for your business. Facility – Your facility is your business. Clients come to relax, renew and enjoy your space. When a spa is outdated, business will suffer. Services – Services are the extension of the business’s vision and mission. They need to deliver an experience to the client consistent with the vision and mission. Products – Retail is an integral part of a spa. Retail products work synergistically with service. When there is a misalignment, the business wdill lose profits. Spas often either carry brands that don’t align to their spa vision and culture or the prices are wrong. The result is that the products are not supported by the staff and therefore NOT SOLD. Designing a solid retail platform is a must. Internal Marketing – How you reach your clients with marketing and loyalty programs. If you don’t market to your existing clients, you are missing out on developing a loyal client base. Spa Culture – The spa’s vision and mission delivered through exemplary service and client experiences. If there is no spa culture or vision, nothing is binding your team together. Your spa culture also flows into your brand and marketing messages. Knowing how important these components are to your spa business, what steps are you taking to protect your business? What are the necessary changes to prevent your ecosystem from dying? 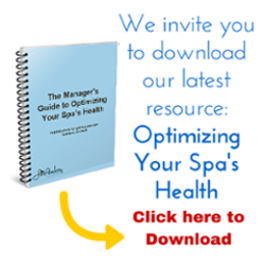 There are no quick fixes, but if you’re determined to keep your business going and ever-improving, we’ve created a resource to walk you through a thorough analysis of the factors affecting your spa business.